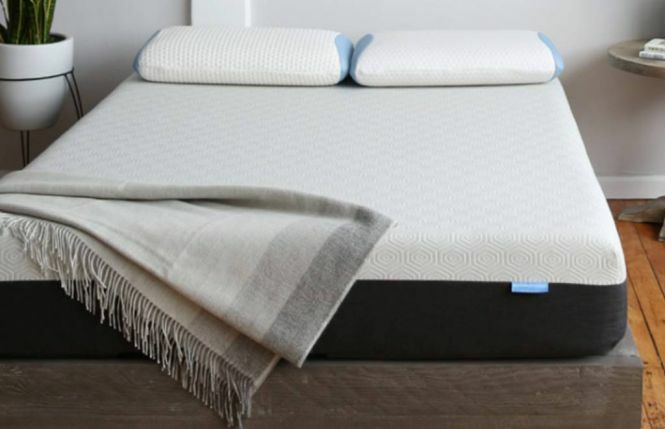 The Hybrid Latex mattress by Nest Bedding is offering a 13″ thick and luxurious latex hybrid mattress at an affordable price. This mattress uses the natural responsiveness and cooling properties of Dunlop latex to provide premium comfort. A quality heavy duty coil system is also used for optimal support and spinal alignment. This hybrid is than covered in a super soft and breathable cotton cover with wool quilting. This makes an extra layer of plushness that creates a very meticulously crafted bed. You even have the option of choosing between medium and firm. As well as opting to split the comfort, now you and your partner can have the perfect feel. This hybrid is setting the standard for luxury and comes right to your door in a convenient box. Nest Bedding’s mattresses also come with a lifetime warranty and 100 night sleep trial. Get ready for an ideally comfortable and cooling mattress that won’t disappoint. Below we have our Nest Bedding’s Hybrid Latex mattress review. We will go through how it performs for off gassing, comfort, motion transfer, sleeping cool, edge support, value, material, trial and warranty. Keep reading our in depth review of the Hybrid Latex by Nest Bedding mattress below. We will go over how this bed performed for us as well as a comprehensive look at how we reached the score for our ratings. The very first thing we needed to do with our new Nest Bedding Hybrid Latex Mattress is take it out of the box and get it set up. It should show up right at your door and in a fairly compact box, for a mattress anyway. Getting it to where it needs to go will take two sets of hands. It is about 110 lbs and a little awkward to maneuver if you’re on your own. Once you get it to where you’ll be sleeping it should only take a few minutes to get it out of the box and take it out of the plastic and come to life. During the unboxing process you will notice a very minimal amount of off gassing. Any scent with this mattress will be a more natural smell from the latex. With most boxed mattresses there will be a little bit of smell once it is allowed to unroll and take shape, but this one is made in the US which helps tremendously with cutting down on any noxious odors. It should be fine within a few hours but if you are more sensitive to certain smells letting it breath up to 12 hours would probably be a good idea. When setting up your new mattress it will need a foundation that provides a flat, even surface that will support the weight of the mattress as well as the sleepers. It also will need to be the right height for you as well as be aesthetically appealing. 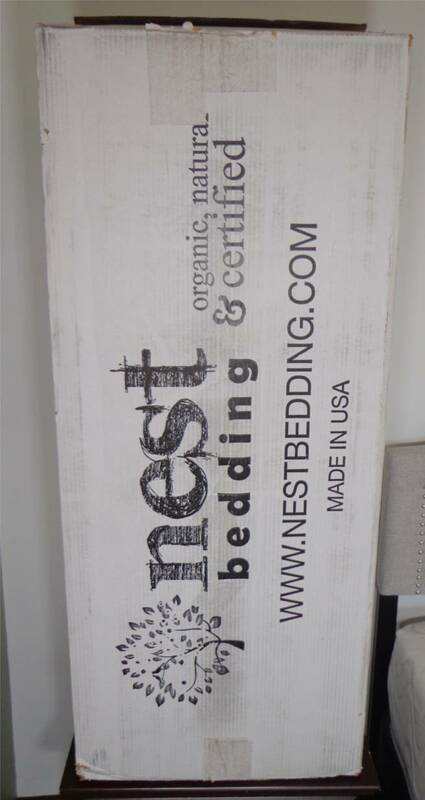 Nest Bedding also sells box springs, adjustable bases and platform beds. Otherwise the Alexander hybrid mattress would work great on any box spring with or without a frame, an adjustable base, a platform bed or slatted bed. Nest Bedding Hybrid Natural Latex mattress comes in two comfort levels, medium and firm. Both will be great for pressure relief, adaptable support and easy to move on. This mattress is a truly luxurious and quality bed that has great comfort for all. The medium option provides a great combination of support and cushion. This option would work great for back, stomach and side sleepers and is going to be best for people who like a supportive feel but with still a little extra softness. The medium option will be a true medium feel and will fall at about a 5 on the firmness scale, with 1 being the softest and 10 being the firmest. It has a great amount of sink and hug but is well supported by the coil system. 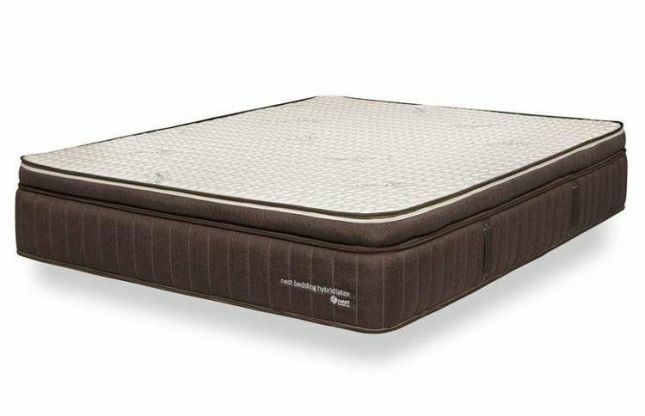 If you like the feeling of a little more cushion on the top but still has a solid foundation and supportive core than you will like this mattress. The firm option is going to appeal to people who like to not sink in too much in the mattress and more than likely sleep on their stomachs and back. It will also work great for the heavier person who needs more support too. Having these two options really allows for you to find what will work best for you. The firm option will be a medium-firm feel and will fall at about a 7.5 on the firmness scale. It has a just a bit of sink and hug and is more of an “on the bed” feel. If you like the feeling of a little less cushion on the top but still enough to be comfortable, along with a supportive core than you will like the firm hybrid. *One thing to note with the feel of this mattress is that it is more responsive. If you like the feeling of having a bit of spring in your foam than this a great mattress for you. If you prefer having a more hugging feel than you may want to look for something that incorporates memory foam. The Nest Bedding Hybrid Latex mattress is made of heavy, dense Dunlop latex as well as individually wrapped Quantum coils. 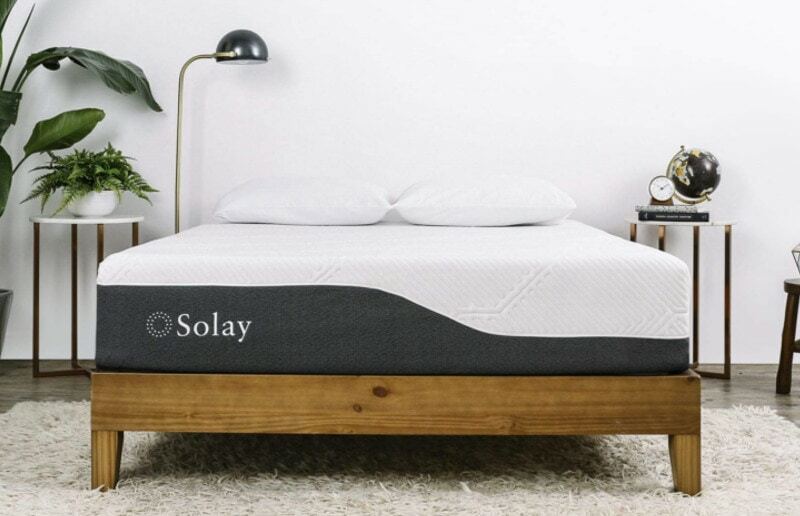 This mattress may have a bit more spring than several other all foam or memory foam mattresses because of the natural buoyancy of its materials. However, using the pocketed coils that are each wrapped in fabric help reduce any motion in the coil system. Also, using Dunlop latex instead of Talalay will make for a denser latex that will absorb more vibration and soften any movements being felt. This mattress will be easy to move on, but shouldn’t make for much for partner disruption. The materials in the Nest Bedding Hybrid Latez make it ideal for warmer sleepers. This bed uses a coil system for the support and base of this bed. A mattress with a coil system is always a plus for a warmer sleeper because it allows for plenty of air to flow and any heat that is retained to easily dissipate. Having a place for built-up heat to escape is key in maintaining an ideal temperature while sleeping. 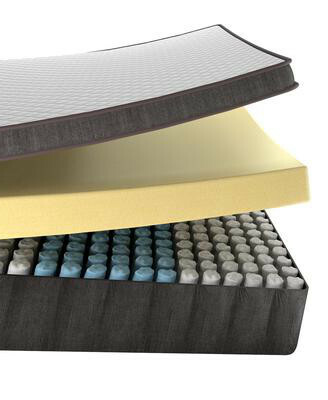 This hybrid mattress also uses Dunlop latex as the only comfort foam over the coil system. Latex is great for warmer sleepers because it is naturally aerated as well as more responsive. This allows for sleepers to not feel stuck in the mattress and easily change sleeping positions. The easier it is to move the less likely you are to stay in a warm, cocooned heat retaining sleeping position. Lastly, the cover on the Nest hybrid latex mattress uses a soft, breathable cotton that allows for plenty of air flow. This is layered over a quilted pad of naturally moisture wicking wool. Wool is also anti-microbial, dust mite resistant as well as naturally fire resistant and temperature controlling. All of these attributes make for a truly exceptional mattress that will keep you comfortable in every aspect. The edge support on the Nest Bedding Hybrid Latex mattress will feel stable and creates a solid, edge to edge usable sleep surface. The edge support from the 5 zoned pocketed coils provide the necessary support to give the entire mattress a solid foundation, including the edges as well. Sleeping on this mattress you are able to feel a consistent feel across the entire top of the bed. Even the edges of this mattress will feel stable while sitting and will make for fine use while sitting minimally. This mattress comes in at $1599 for a queen size and that includes free delivery, a 100 night sleep trial and a 10 year warranty. For the quality materials, cooling properties and comfort of this mattress we find this price point to be a great value for this mattress. Also, SAVE $150 with code: NEST150 to make this mattress a much more affordable $1449. Get yours now at NestBedding.com. Our Sleep Guide has the latest pricing as well as any and all available coupons or discounts for the mattresses we review. We have a direct relationship with Nest Bedding and make sure that we pass along the most up to date savings and discounts to our readers. The Alexander Hybrid Luxury mattress has a 100 night sleep trial period. This is the online mattress industry average and what is typical offered. This trial period allows for a sufficient amount of time to see if this mattress is a good fit for you and also has a very easy return process if it isn’t. If you are looking for more specifics for the Nest Bedding trial period find out more at nestbedding.com or for a helpful tool check out Our Mattress Warranty & Trial Period Guide. This mattress has a limited lifetime warranty. Like most mattress warranties the Alexander Signature Hybrid warranty is prorated to coincide with the natural average wear of the bed over time. This warranty provides coverage over any defects that occur during the life of the mattress. These defects include visible sagging of at least 1″, manufacturers flaws in the construction or cover of the mattress. This warranty provides consumers with the confidence that this is a product that the company will stand behind. If you are looking for more specifics for the Nest Bedding warranty find out more at nestbedding.com or for a helpful tool check out Our Mattress Warranty & Trial Period Guide. You want a heavy duty mattress that is durable and uses quality materials and construction. You like the feel of latex and support of coils and want the perfect compromise and ideal comfort. You like a pressure relieving, luxury feeling, cool sleeping high end bed at an affordable price. You like a company that has years of experience and several high quality products that they stand behind 100%. Still looking for some more information? Visit Nest Bedding at nestbedding.com. Also, have questions for us? Please contact us and we would be happy to help you!